Retire to Georgia, it is a favorite retirement destination, perhaps no other place in the US is more suitable for retirees than Georgia. This great state offers affordable living; great climate; shopping; fantastic restaurants; and has the best health facilities in the country. Fitting most any budget, Georgia is fast becoming recognized as the place to retire to. Retire to Georgia and find two cities in which have been chosen for their warm climate and scenic beauty: St. Mary’s and Savannah. St. Mary’s is one of two fishing ports near to beaches and waterways. Their recreational facilities and town centers offer a wide array of activities including fishing and golf. 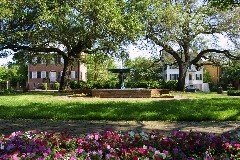 Savannah, well known as the most beautiful city in Georgia, boasts a lifestyle which encompasses historic towns; beaches; shopping; restaurants; museums; galleries; theater; music; and a wide variety of recreational activities. Moreover, buying a home in Georgia affords you low property taxes, and hosts the top four medical schools in the country. Their quality of medical care throughout the state is certainly a consideration if you choose Georgia an ideal place to retire. Let’s take a look at these two cities up close and personal. Retire to Savannah, known for its Southern hospitality, great climate, culture and natural beauty and an abundance of health care facilities. With its 18th century towns, you can relax and enjoy a lifestyle filled with beaches and rivers, shopping and dining, museums and galleries, theater and music, and sports and recreation. Click here to learn more about Savannah. Perhaps you live in a big city in the northeast, where the winters are icy and the summers are humid. Retirement is just around the corner, and you need to decide where to retire to. Well, here is a suggestion for you: Retire to Athens, Georgia. Click here to learn more about Athens. Retire to Marietta and discover one of its seasonal attractions, The Marietta Square Farmer’s Market. It is an integral part of the Marietta and Georgia agricultural community. The many vendors offer the best of locally grown products in Georgia; you can visit the Market every Saturday, usually from May through September 1st. Read more about Marietta.